The new design of the ErgoStyle Flexion table offers full, ultra-smooth counterbalanced flexion, distraction or circumduction, effortlessly meeting the core needs of your practice. Manual flexion/distraction is built right in, with infinitely variable electric spring tension so you can move the caudal section in any direction with just the touch of a finger. For added flexibility, the table also quietly elevates from its lowest height (19”) and to its full height of 32”. 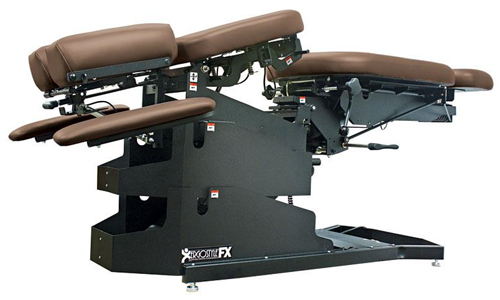 The fully modular design allows for upgrades now or in the future, including three drops, auto-cocking, auto flexion, headpieces, chest pieces (including long asis distraction), dual auto-cocking foot control, dual elevation foot control, dual tension foot control, T-bar handles and super silent air compressor options.